UEFA has released their annual report on financial health of football entities across Europe and according to recent financial details Manchester United is not only the club with highest yearly revenue but also has the highest net debt. The interesting fact that even with the highest revenue United has failed to reduce their net debt which stands at €536 million and thats around 25% increase compared to last fiscal year. 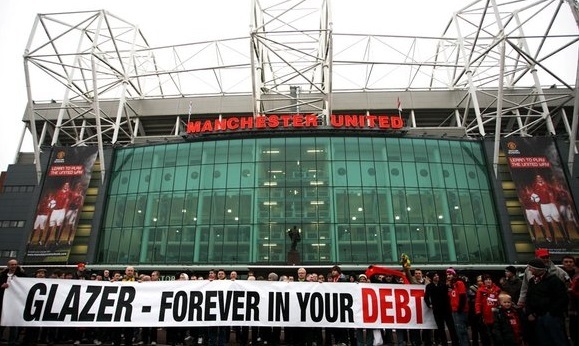 We take a look at clubs with highest net debt across Europe. 3 Inter Milan $325 million (in worst possible financial situation and things not looking bright with inter posting another $78 million net loss in 2016. 8 Chelsea* technically debt free but Roman Abramovich’s $1 billion investment counts if he decides to sell the club. UEFA really should start using FAIR PLAY and tell these teams to work on lowering their debts fast but for now they shouldn’t be allowed to be in the CL or Uefa Cup games. This is so unfair to those teams in Europe with no debts at all !! !